If you bite me once, then shame on me. If you bite me twice, then you must be the Lernaean Hydra! The Lernaean Hydra or Hydra of Lerna (Greek: Λερναῖα Ὕδρα, Lernaîa Hýdra), more often known simply as the Hydra, was a serpentine water monster in Greek and Roman mythology. Its lair was the lake of Lerna in the Argolid, which was also the site of the myth of the Danaids. Lerna was reputed to be an entrance to the Underworld and archaeology has established it as a sacred site older than Mycenaean Argos. In the canonical Hydra myth, the monster is killed by Heracles, more often known as Hercules, using sword and fire, as the second of his Twelve Labors. According to Hesiod, the Hydra was the offspring of Typhon and Echidna. It possessed many heads, the exact number of which varies according to the source. Later versions of the Hydra story add a regeneration feature to the monster: for every head chopped off, the Hydra would regrow a couple of heads. 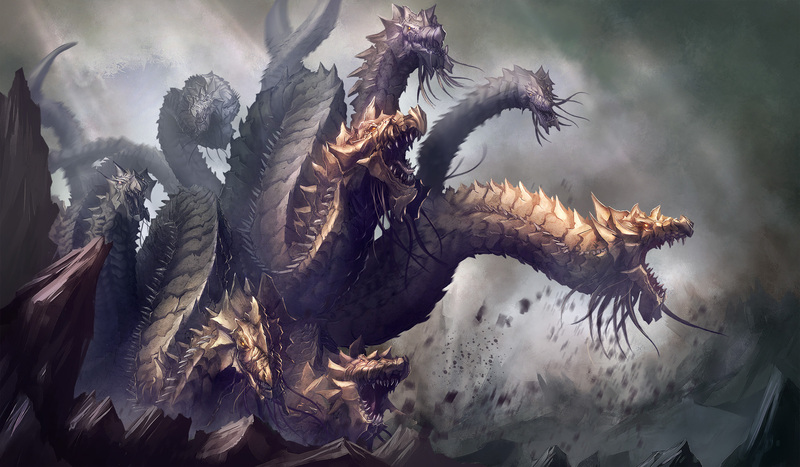 The Hydra had poisonous breath and blood so virulent that even its scent was deadly. Heracles would later use arrows dipped in the Hydra’s poisonous blood to kill other foes during his remaining labors, such as Stymphalian Birds and the giant Geryon. He later used one to kill the centaur Nessus; and Nessus’ tainted blood was applied to the Tunic of Nessus, by which the centaur had his posthumous revenge. Both Strabo and Pausanias report that the stench of the river Anigrus in Elis, making all the fish of the river inedible, was reputed to be due to the Hydra’s poison, washed from the arrows Heracles used on the centaur. If you want more to chew on, you can read it here on Wikipedia.